What type of medication is CONVENIA® (cefovecin sodium)? CONVENIA is part of the group of antibiotics called cephalosporins. It is manufactured and distributed by Zoetis. What infections or conditions does CONVENIA treat? 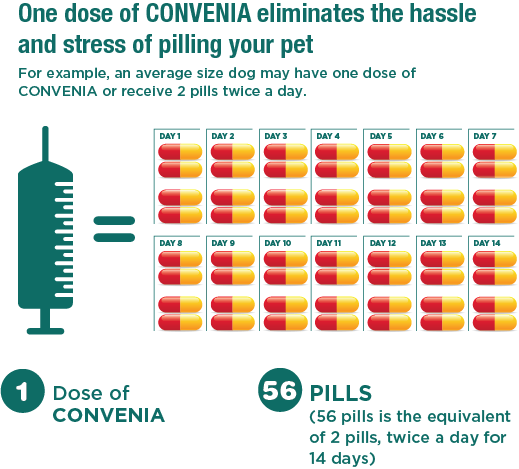 CONVENIA treats common bacterial skin infections in dogs, including superficial pyoderma in dogs as well as abscesses and wounds for both cats and dogs. These conditions can cause itching, scratching, licking and biting, and may be painful. How does scratching and biting make pet skin conditions so much worse? When your dog's or cat's skin is broken or damaged by scratching, chewing or rubbing, it creates an opportunity for additional or secondary infections, allowing bacteria that's normally kept out to penetrate your pet's skin. How is CONVENIA different from most antibiotics approved for feline and canine bacterial skin infections? What are the benefits of CONVENIA? 2. Stress-free dosing: Up to two weeks of treatment with one injection*1,2 means your pet doesn't have to take daily pills, and you don't have to worry about keeping a dosing schedule. 3. Peace of mind: Confidence that your pet is getting the full course of medication recommended by your veterinarian. What is the dosage of CONVENIA, and how is it dosed? CONVENIA is administered by your veterinarian as an injection under the skin. The dosage is based on your pet's weight. How long does it take CONVENIA to start working in a dog or cat? Every pet and every infection is different. Peak blood levels are seen within 2.0 hours in cats2 and 6.2 hours in dogs.1 This means that CONVENIA can start killing the bacteria quickly. However, this is not when you would expect to see an improvement in the skin. Based on the severity of the infection, your veterinarian is best able to predict when a difference in the skin is likely. How long does CONVENIA last or stay in the system of a dog or cat? How often can my dog or cat receive a shot or injection of CONVENIA? For cats, CONVENIA should be administered as a single, one-time injection. For dogs, a veterinarian may later administer a second dose under specific circumstances if your dog's response to therapy is not yet complete. Have there been any reported adverse reactions or side effects to CONVENIA? Allergic reactions to CONVENIA are possible. The primary side effects reported with CONVENIA injections in cats and dogs are vomiting, diarrhea, lethargy and decreased appetite. These side effects are uncommon, similar to the incidence rates of other antibiotics. Zoetis takes its responsibility to collect information on side effects very seriously. We have a call center where you can report any adverse reactions or ask any questions. Please call Zoetis at 888-ZOETIS1 (888-963-8471). How much does a CONVENIA injection cost? The cost will vary based on the size of your pet. Your veterinarian will be able to answer this for you. Where can I buy CONVENIA? Is it available at pharmacies or pet supply stores? CONVENIA is a prescription-only product. It is an injection that must be administered by a veterinary professional. Ask your veterinarian about CONVENIA. 1. Six R, Cherni J, Chesebrough R, et al. Efficacy and safety of cefovecin in treating bacterial folliculitis, abscesses, or infected wounds in dogs. J Am Vet Med Assoc. 2008;233(3):433-439. 2. Six R, Cleaver DM, Lindeman CJ, et al. Effectiveness and safety of cefovecin sodium, an extended-spectrum injectable cephalosporin, in the treatment of cats with abscesses and infected wounds. J Am Vet Med Assoc. 2009;234(1):81-87. 3. Stegemann MR, Sherington J, Blanchflower S. Pharmacokinetics and pharmacodynamics of cefovecin in dogs. J Vet Pharmacol Ther. 2006 Dec;29(6):501-511. 4. Stegemann MR, Sherington J, Coati N, Brown SA, Blanchflower S. Pharmacokinetics of cefovecin in cats. J Vet Pharmacol Ther. 2006 Dec;29(6):513-524.